Our team of recruiters is are connected within the Houston IT market. With years of field experience and a background in development, our recruiters know how to identify and recognize app developers who can combine cross-platform expertise with the ability to perform within a business environment. We use an in-depth screen process known as Conclusive Hiring that’s designed to not only match talent in terms of technical skills and cultural fit, but also in terms of ability to solve problems, work efficiently and effectively. Find the right IT developer talent for your organization with Decide Consulting. Why Choose Decide Consulting for IT Developer Recruiting? Decide Consulting is a premier IT recruiting firm providing Applications Development and other technology professionals to leading companies. Our recruiters specialize in delivering top App Development talent on a Contract, Project-Based, Long-Term and Permanent basis. Our IT recruiters have successfully deployed countless top-level professionals to assist in everything from development and design all the way to testing and implementation. What makes us unique? We understand that you have projects to deliver on and deadlines to meet and that, especially in the IT industry, time-to-hire and speed are critical. We go beyond simply assessing technical skills and cultural fit to discover whether or not each candidate can be defined as “problem-solver”. This means they are capable of progressing a project, making software that works and finding ways to overcome challenges and obstacles. Find Out How our IT Staffing Services Can Help Your Team/ Business! Is your company able to attract top IT talent? How competitive are your employees’ IT salaries? 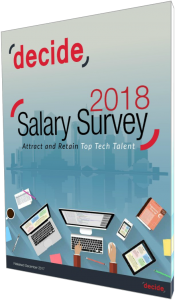 Find out with the 2018 IT Salary Survey.